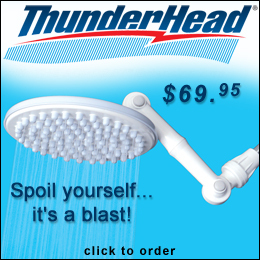 How do I clean ThunderHead? You are here: Home / FAQs / How do I clean ThunderHead? ThunderHead solves this problem without even taking it off the pipe. The spray jets made of rubber and are large, soft, and hollow. All you do is pinch them to break up and flush out any build-up. Brush your hand back and forth across the head to remove any sediment that’s collected.